New from Slate: Joe Biden ring tones and more political sound bites for your phone. Already got a dozen Barack Obama headbands? It’s time for a new campaign accessory: Slate’s political ring tones. Get one of these clips, and you’ll hear John McCain say, “My friends,” every time you get a call. Or if you’re in a less friendly mood, you can switch to the “Shame on you, Barack Obama!” ring tone. To get a ring tone, send a text message with one of the order codes listed below to the number 98999. For the Hillary laugh, for example, text SLATE LAUGH to the number 98999. We’ll send the ring tone to your phone as a text message that includes a downloadable link. For more detailed instructions, click here. Or if you just want to listen to the clips on your computer, click one of the embedded players below or use the “Download MP3” links to save to your hard drive. Slate’s political ring tones are free of charge, though standard text-messaging rates may apply. Please see our terms and conditions for more details. 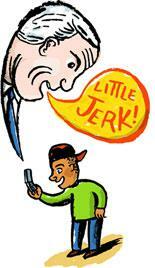 John McCain calls a young questioner a “little jerk.”Text SLATE JERK to 98999 to get on your phone.